"We gave them a civil war? Why? Because we failed to prevent it? Do the police in America have on their hands the blood of the 16,000 murders they failed to prevent last year?" If the police invaded and destroyed, say, South Central Los Angeles, bombing the place into rubble and installing a puppet "government" that employed death squads to do its bidding, then, yes, they would indeed have the blood of the victims on their hands. What’s jaw-dropping, however, is the completely amoral stance of an alleged "conservative" like Krauthammer, who yelled himself hoarse calling for war with Iraq and now blames the "liberated" Iraqis for the fate that has befallen them. Conservatives used to believe in taking responsibility for the consequences of one’s actions and living with them. Not Krauthammer. According to him, the internecine warfare in Iraq is "bewildering." Really? I don’t buy that for a minute, just as I don’t believe that the intellectual architects of this war are horrified by what is happening in Iraq today. Anyone could have predicted the probable results of an American invasion: a Sunni minority ruled Iraq for decades while a Shi’ite majority groaned under the increasingly heavy burden of a sectarian tyranny  was there ever any doubt that the destruction of the Ba’athist regime would lead to chaos and civil war? Not on my part  and not, I firmly believe, on the part of any of the more informed war advocates, either. They are neither "bewildered" nor even much bothered by the sectarian slaughter in Iraq  because it’s just what they wanted all along. That’s one more Arab country that is divided, unable to offer resistance to the U.S.-Israeli battle plan, which aims at nothing less than the "liberation" (i.e., utter destruction) of every nation in the Middle East. Do you think Krauthammer is saddened by the vicious killing that is now taking Iraq down into a bloody abyss? Not a chance. The neocons hate Arabs, all of them, Shia and Sunni alike (and the Persians, too). As long as these folks are killing each other, they can’t attack the United States  or Israel. That‘s what motivated the invasion of Iraq, and it’s what is pushing them to do the same to Iran  sheer malevolence, but malevolence, I might add, with a purpose. Notice how the neocons are pushing this idea of splitting Iraq up into its religio-ethnic components: that’s another aspect of the atomization strategy they’re employing in the Middle East. Smash and reduce the Muslim nations to splinters  set the Azeris against the Persians, the Kurds against the Arabs, the Shia against the Sunni, and let the catastrophe spread from Beirut to Tehran to the oil fields of Saudi Arabia. "Among all these religious prejudices, ancient wounds, social resentments, and tribal antagonisms," complains Krauthammer, "who gets the blame for the rivers of blood? You can always count on some to find the blame in America." Aside from Osama bin Laden and his immediate circle few blame "America," in the collective sense: there are, however, a few American individuals who bear ultimate responsibility, and they are known as neocons, i.e., Krauthammer and his gang of world-conquering "liberators." They plotted and pined for war, they falsified the "intelligence" to fit their goal of "regime change," and when the blood began to flow  after the "liberation" and the celebrations of a "mission accomplished"  they washed their hands of it and blamed the victims. That’s about par for the course with the neocons: after all, aren’t they blaming the hapless idiot Bush for bollixing up their glorious war  for not putting in enough troops, for disbanding the Iraqi army, for supposedly not following their prescriptions to a tee? The axis of chickenhawks got what they wanted  death and destruction in the Arab world on a massive scale  and now they’re busy assigning the blame to everyone but themselves. nothing. Michael Ledeen, the Machiavelli of this crowd, calls it "creative destruction." 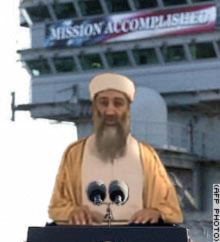 I’m not sure how creative it is  although I guess it depends on what you’re trying to create  but clearly, by these standards, they have every right to claim Iraq as a "victory" and crow "Mission accomplished!" "Did Britain ‘give’ India the Hindu-Muslim war of 1947-48 that killed a million souls and ethnically cleansed 12 million more? The Jewish-Arab wars in Palestine? The tribal wars of post-colonial Uganda?" The British didn’t come in with the idea of destroying the local culture and political structure, but of subsuming it under their own suzerainty in the classical pattern of imperialism. The consequences of that policy played out over a much longer period of time than what is occurring in Iraq, but, yes, the British do bear some responsibility for the Hindu-Muslim pogroms. The British incursion interrupted and prevented the development of an indigenous solution to the sectarian divide. Who knows what direction the history of the region might have taken if the British hadn’t intervened? In the end, their policy of "benevolent" imperialism didn’t prevent the catastrophe but only delayed it  and probably exacerbated it, by keeping it under wraps for so long. As for the Jewish-Arab wars in Palestine  is Krauthammer seriously asking whether the Balfour Declaration had anything to do with making Palestine a perpetual battleground? By taking up the cause of Theodore Herzl and making the implantation of a settler state possible, the legacy of British imperialism will afflict the entire region for the foreseeable future. Imperialism always has a deforming effect, whether it be in Iraq, Palestine, or Uganda, precisely because it is founded on coercion. The U.S. has gained no political or economic advantages from the invasion and occupation of Iraq. Quite the contrary, we are paying through the nose, and the economic costs (totaling some $1 trillion) are almost as high as the political price  world isolation and the threat of terrorism on U.S. soil. This is not imperialism: it is the foreign policy of a lemming state.